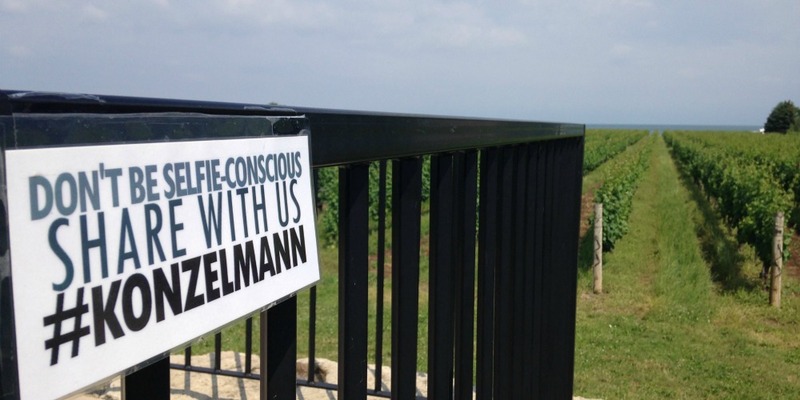 Despite the tedious about of red tape involved with managing a municipality’s social media, the City of Hamilton provides an excellent example of creativity that sparks engagement from key residents. 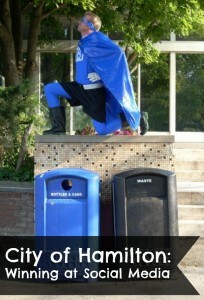 Since the mid-2000s, the City of Hamilton has been running a promotion for residents who are recycling superstars. These promotional yellow recycling boxes, otherwise known as Gold Boxes, are reserved for residents who correctly sort organics, paper, aluminum, glass, and plastic – while still only using one bag of garbage or less. A City of Hamilton employee completes a curbside audit, checking for a number of things, and chooses to reward the resident with a Gold Box. While the program has been around for several years, maintains a website, and a now defunct BlueBox Man Facebook Page it may have received one of the best promotions this past week via social media. This past week, one of the Gold Box winners was a musician from the Arkells, a super amazing band that hails from Hamilton. 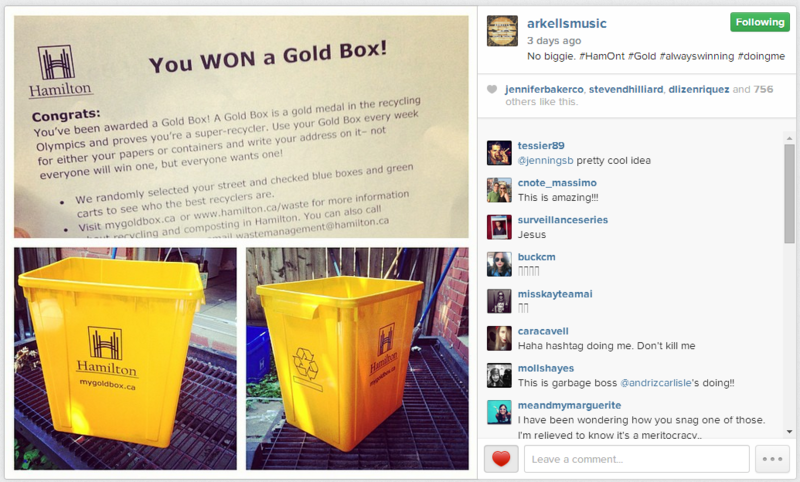 Clearly excited that his ninja recycling skills had been recognized, he posted a photo of his newly acquired Gold Box to the Arkells’ Instagram feed, which also was shared with the @ArkellsMusic Twitter account. You think it couldn’t get any better: tonnes of free promotion for the program; and, a conversation with residents about saving the planet. Then it does. Why is this response so great? 1. 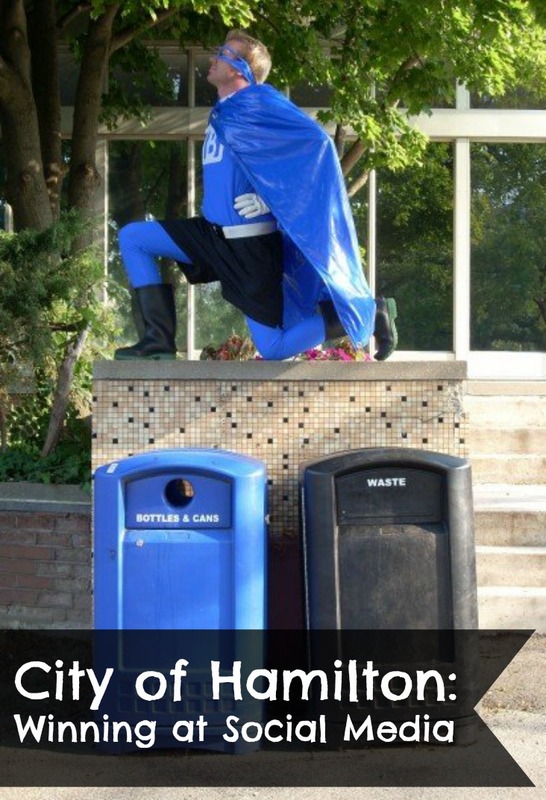 LISTENING: Despite not being officially mentioned, the City of Hamilton was listening to what was being said about their program and key hashtags. 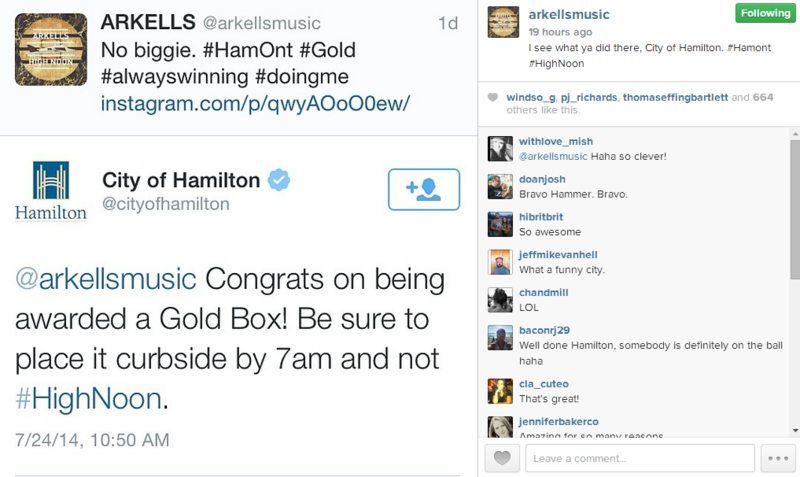 By doing this they were able to engage with the Arkells about their Gold Box excitement. 2. RELEVANT & CHEEKY: The City of Hamilton’s tweet includes information about the recycling program: “Be sure to place it at curbside and not #HighNoon,” while at the same time giving a nod to the Arkells’ upcoming album High Noon. The Arkells took a screenshot this conversation and posted it to their Instagram feed. This conversation garnered 663 Likes, and 16 comments. 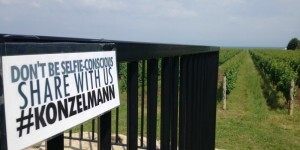 While municipalities do face many political constraints, it can be beneficial to allow the folks who handle social media a bit of leeway to engage with residents. You never know what conversations may “Come to light” when you do. Having invested the last eight consecutive Mondays from 8:00pm-10:00pm with ABC’s The Bachelorette, I’ve decided to do some social media research on the remaining bachelors. Based on Twitter profiles alone, I believe the finalist will be Chris Soules (@C_Soules). (1) Either Chris isn’t telling us something, (2) he’s ACTUALLY a social media marketer and not a farmer, or (3) someone is managing his account. 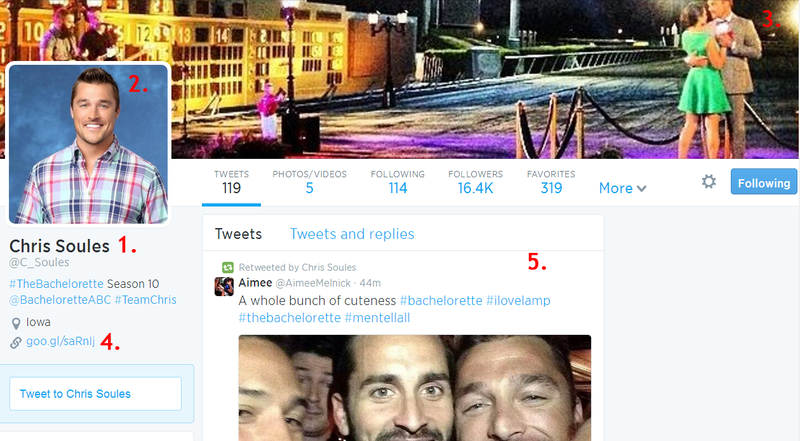 Good Twitter Name & Username: Chris starts out on the right foot on Twitter by using his complete name as the Twitter Name, as well as a relevant username (@C_Soules). He clearly knows that fans will be searching Twitter for his name! 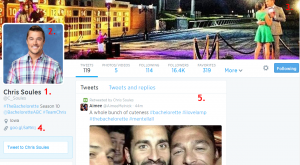 Relevant Profile Picture: Chris has used his official photo from The Bachelorette website. When fans are searching him, they will know the instant they come across this friendly farmer’s Twitter account. Yeehaw! Website: This conveniently links to his Facebook Page. Well done. He also has a mention and hashtag used in his bio! Non-Descript Username: Points for Josh using his full name as the Twitter Name. He does not, however, feel the same way about his username. While “Josh Murray” is a common name, he should have tried to secure a username that resembles his name. Profile Picture: Josh, while claiming many times that he is not the “jock-type” chose a photo of himself wearing an athletic uniform, rather than The Bachelorette’s official photo. First Tweet:… was back in 2010. Although tweets reveal that he’s more comfortable posting to Instagram than Twitter. For someone’s who has been using Twitter for four years, Chris is clearly a faster learner than Josh. Name & Username: As an account executive, Nicholas did himself well with a good username, and a somewhat relevant username. 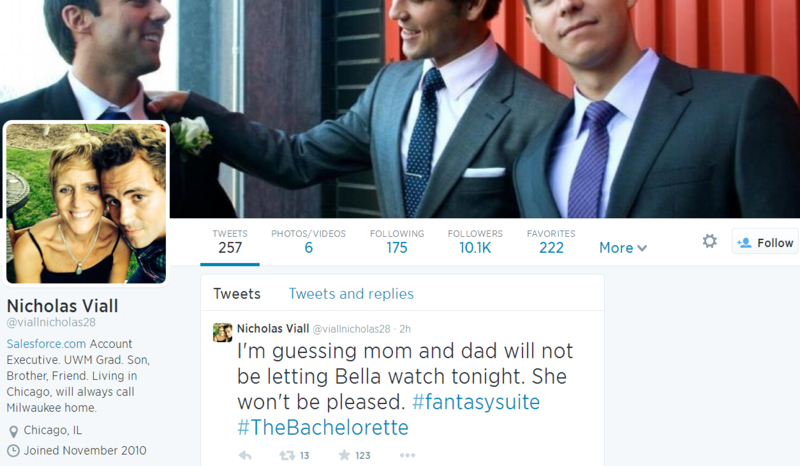 (Note: During my research I stumbled upon a very negative and unhappy Nicholas Viall. I didn’t know it was such a common name). Profile Picture: Nick clearly loves his mom. His profile picture shows! Nice personal touch. Cover Photo: It’s a nice cover photo of Nick (I assume) as a groomsman in a wedding. Also a very lovely and personal picture. Website: He includes a website in the bio section to Salesforce.com – the company to which he’s employed. No where in the description does he mention that he was a contestant on The Bachelorette. 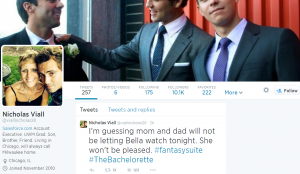 Tweets: His tweets are a healthy mix of Bachelorette promotion, real life, and retweets. Seems legit. I am positive there is a clause in The Bachelorette contract regarding social media during and following the taping of the show. That said, Chris’ doesn’t seem like the Twittering-type, yet he does it in such a timely and professional manner. THIS is the reason that I think he’s the winner.